IN SOME PRECINCTS, this is what passes for a joke about libertarians: "Ayn Rand, Rand Paul, and Paul Ryan walk into a bar. The bartender serves them tainted alcohol because there are no regulations. They die." The humor there eludes me, but it must work for someone: That alleged witticism has garnered tens of thousands of Twitter "likes" and retweets. Lame-o jibes about tainted alcohol notwithstanding, libertarian policy ideas have made some important gains recently. Perhaps the most significant is the growing support for rolling back occupational licensing, so that more people can work without needing Big Brother's consent. 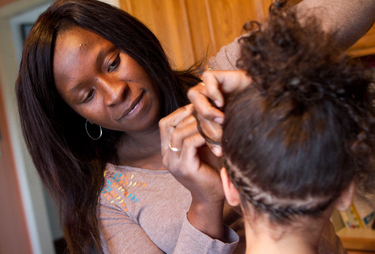 Why should a hair braider — like Jestina Clayton of Centerville, Utah, shown above — need a permit from the government in order to ply her trade and make a living? If baristas, illustrators, and journalists can operate free from government licensing, hair braiders, painting contractors, and acupuncturists can too. 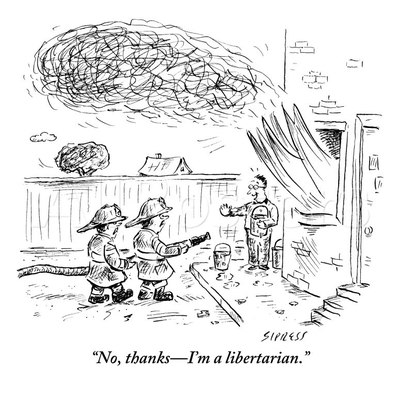 It's fine to walk in to the Libertarian Bar. Your drink will be safe, even without a government certificate on the wall.